Hire-a-Chef Service Brings Kosher Cuisine to Foodies' Kitchens CROWN HEIGHTS — Where does kosher food fit into the city's crowded foodie scene? Right into people's own kitchens, according to a local chef on a mission to serve adventurous Jewish food to anyone who wants it. Chef Yuda Schlass, of Crown Heights, has long bridged the divide been Jewish and foodie cultures. His parents ran hip macrobiotic kosher eatery The Cauldron in the East Village in the '70s and later a kosher catering business in Jerusalem. Schlass picked up the family trade, starting his own restaurant and catering business, Hassid+Hipster, last year. “I’ve always been looking for interesting ways to do Jewish cuisine,” he said. Now, he a has a new outlet through Kitchensurfing, a site that pairs people with chefs who come to cook in clients' own homes. As of the beginning of July, kosher food is on the menu, thanks to a partnership between the site and Schlass, who has trained chefs in strictly kosher cooking that’s anything but traditional. Different menus on the site include a "Persian-inspired" dinner, an Israeli brunch and a family-style barbeque with grilled lamb, chicken, goose and red tuna. 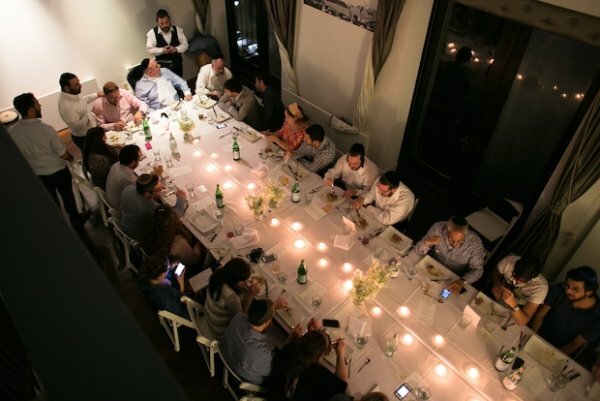 At a launch party for the new kosher section of Kitchensurfing, chef Eric Bolyard of Eleven Madison Park and chef Ygael Tresser prepared a seven-course kosher meal at Schlass’ home in Crown Heights. The evening showed off the high end of what Kitchensurfing offers, which can set a client back hundreds of dollars per plate, Schlass said. But costs are negotiable and the Kitchensurfing site shows meals for as low as $40 per person. Chefs given strict kosher training and a list of kosher-only markets like BenZ’s market in Crown Heights and Pomegranate supermarket in Midwood are available for hire in the New York area only, from the Upper West Side to the Five Towns region of Long Island. Schlass said he has already seen a lot of demand in Brooklyn, which he calls “the Silicon Valley of food” — and one of the city’s more vibrant foodie and kosher hotspots, with new restaurants like Park Slope eatery Pardes and the Crown Heights wine bar Basil. With “the expanding palate of the kosher community,” he said, he expects the new partnership with Kitchensurfing to do well.